In Russia, they built a monument several centimeters tall, and another monument 270 feet high. There is a little piece of metal that a man is holding: It is a portable monument to the Russian avant-garde, made in Novosibirsk. Its author is the English architect Gabor Stark, lecturer at the University of Kent. He won the international competition WORLDS OF EL LISSITZKY. The monument easily fits into the palm of the hand. It is called “Black Currency”—a small black polygon four millimeters (.15 inches) thick, with a hole in the middle. Along the edges are engraved the names of the cities where Lissitzky—a prominent avant-gardist and an associate of Suprematist Kasimir Malevich—lived. “Black Currency” is a mobile monument. A total of 10,000 of these “monuments” will be produced and sent to avant-garde architects all over the world. 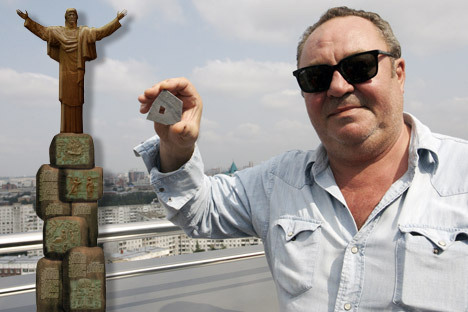 This time, Tsereteli has cast a bronze statue of Jesus Christ 270 feet high—a 33-meter (110-foot) figure of Jesus for the number of years he lived, on a 50-meter (160-foot) pedestal. However, Tsereteli still has not found a place to put it. The sculptor was offered a chance to install it in the mountains of Georgia, but Tsereteli prefers Russia. When the Tsereteli monument is finally installed, it will become the largest statue of Christ in Europe (if the pedestal is included). The largest statute of Christ today is in Rio de Janeiro. In Rio de Janeiro, with wide-open arms, “Christ the Redeemer” blesses the people of Brazil. “But the hands of my Christ are in a different position: They are directed toward the people, and this is ‘Christ the Teacher,’” says the sculptor. Tsereteli made Christ tall, but still shorter than Peter the Great.